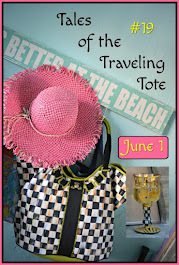 Earlier in June, when Sarah of Hyacinths for the Soul told us about her connection with The Tales of the Traveling Totes (you can read about its origin by clicking on the tote image on my sidebar, or here), I was immediately drawn in. 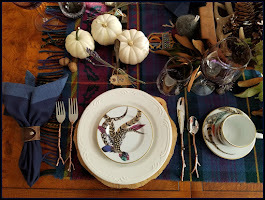 I love MacKenzie-Childs products (no sponsorship, or compensation here, just a product line I like). 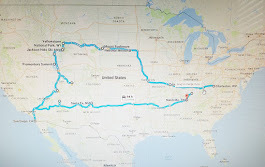 To make a long story longer, I am now a tote traveling tribe member, joining Patti, Sarah, Linda, Debbie, and several other bloggers (noted at the end of this post), here with the latest escapade of the traveling tote - places we've been this summer. 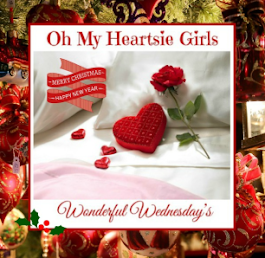 Be sure to also read below on how you can be eligible for Debbie's giveaway that coincides with this month's adventure! As part of the fun in The Tales of the Traveling Totes journey, we've each named our totes. Allow me to introduce my traveling tote, "Miss Luna C". For nearly a month, she's been sitting in the closet, just waiting to go! 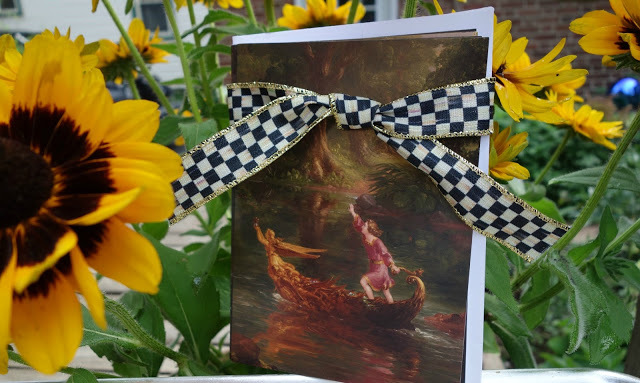 She's been dreaming of her ventures, and her maiden voyage just happened to be an auction. 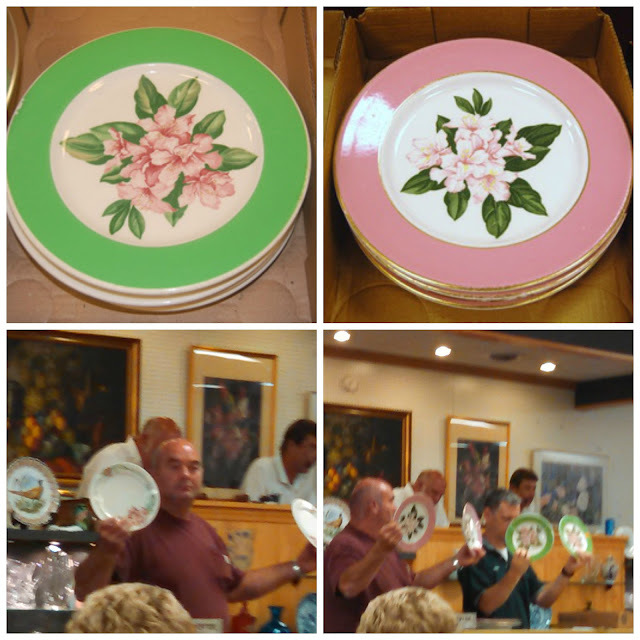 A preview indicated there'd be a few vintage dishes from the Greenbrier Hotel up for bid, and they would easily fit into Miss Luna C's interior compartment. Lo and behold, with a closer inspection, not only were all of the dishes in poor condition (big chips on the undersides), the gavel came down on prices way beyond this gal's limit. (Sorry for the blurred auction action scenes below, but I was at a distance, trying to keep up with the action and zoom simultaneously). I've already got a nice stock of vintage Greenbrier china, so I passed on the dishes. 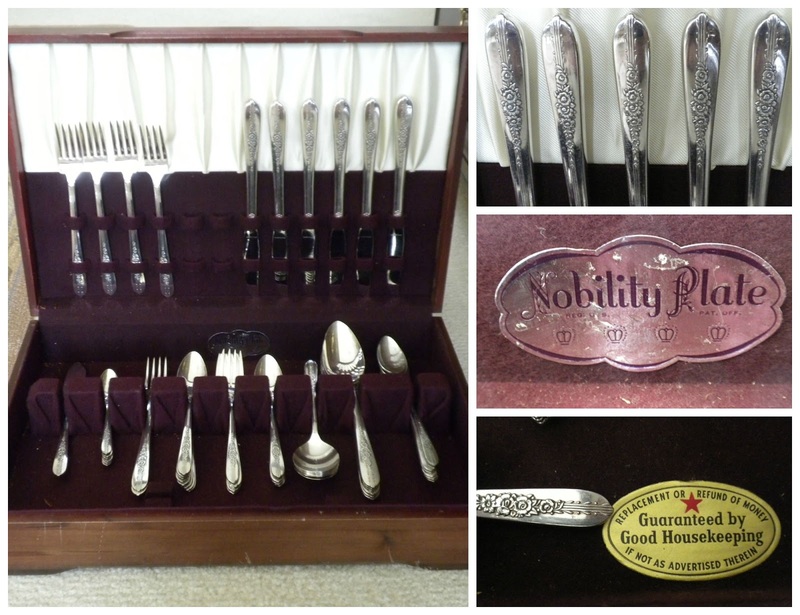 However, I did end up scoring a nice set of 1939 plated flatware, service for six. This little box lot fit quite nicely into Miss Luna C - her first loot hauled! In just a little over one week from now, it's the Route 127 World's Longest Yard Sale. Yep, the Panoply sisters are heading out to the sale in the Kentucky area this year, and Miss Luna C is going along! Hopefully, we'll get a little further than we did the last time we attended - which was about one block, hahaha. Although I think lots of treasures could fit into Miss Luna C, I hardly think something as big as the Calmady Children print from the last LYS will fit (photo below), what do you think? Oh, and then after that, Miss Luna C has big plans of leaving on a jet plane, and heading to - Naples, FL! 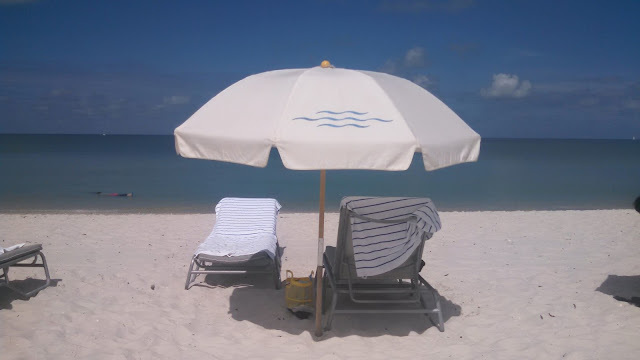 See that yellow bag on the beach in the photo below, between the two chairs? Move over baby, Miss Luna C is ready to amp up the glam for toting water, beach reads, and sunscreen to that beach, and more than willing to carry back shells that may be collected along the shore. 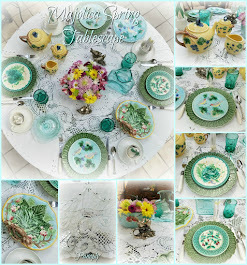 To have a chance for winning her giveaway as part of the Tales of the Traveling Totes series, be sure to stop by Debbie's blog @Mountain Breaths. 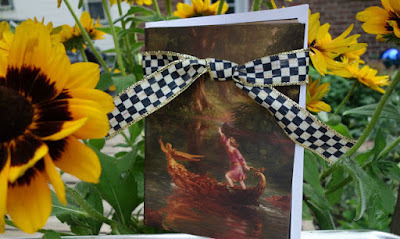 It's a sweet package of 5x7 note cards from her recent trip to Rhinebeck. Since Panoply's buying trip in June, sister M and I have been methodically rotating some of our new purchases into the mix at the antique mall. Enough changes have accumulated that it's worth a few look-sees to those areas in our booth spaces affected. The above photo shows how the main [farmhouse] space currently looks. The next photo shows three different looks in just one week for the center wall, as we transitioned the looks. 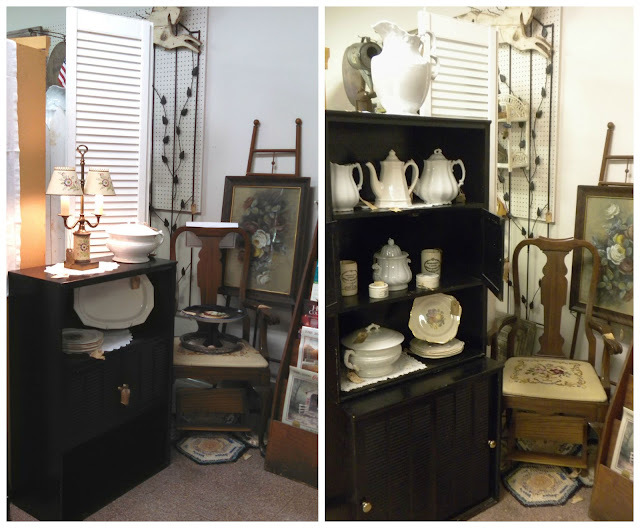 The little Amish bench (above, L) sold, and we were bringing in a very cool jeweler's chest, but it came in two trips, different parts of the week. So the middle frame above was the interim look. The chest, over 100 years old, is solid wood, from a shop in the northern part of the state (Wheeling, WV) that was in business from 1885 to 1961. 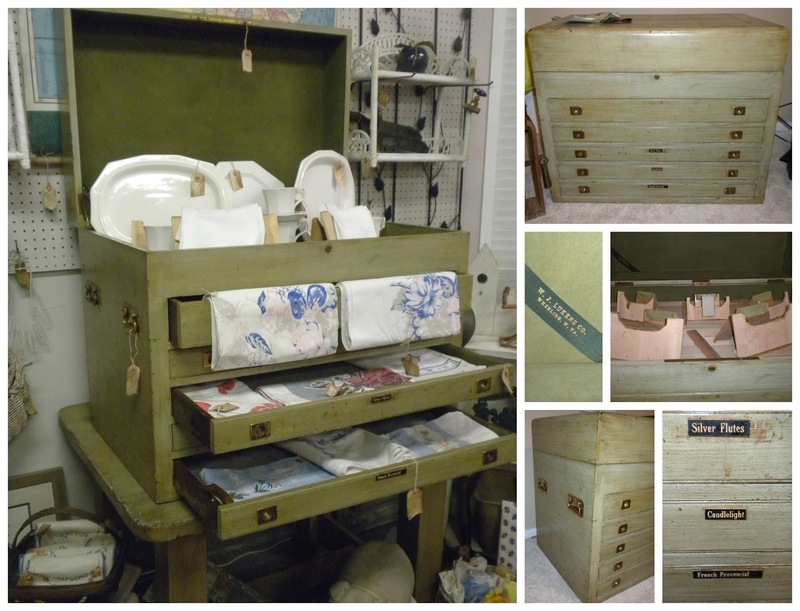 We're displaying some of our ironstone and vintage cotton tablecloths in the top piece for now; however, those flat-file drawers make it very tempting to keep for my antique beaded purses (except I'd have to sand and paint it). Three of the drawers still have the original labels from the jeweler's use. A ribbon label with the shop's name is also inside the lid of the top piece which, by itself, looks and opens much like a cedar chest. 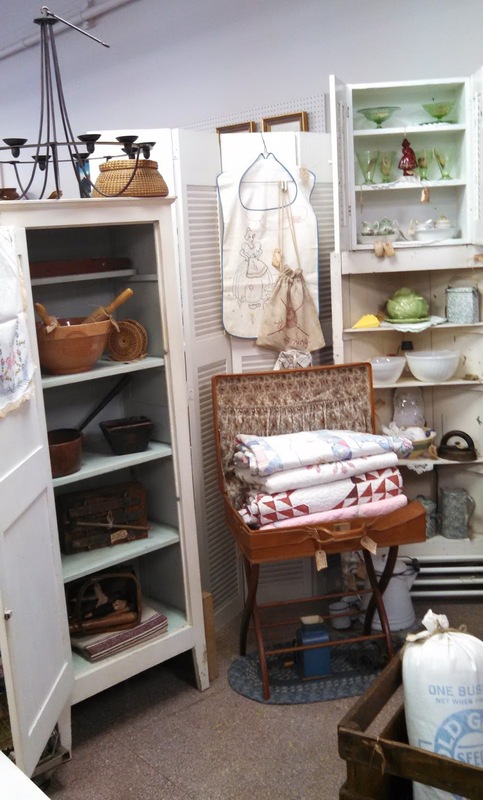 The utility cabinet we purchased in June (above photo) is to the left of center of the farmhouse space, not visible in the first photo. The garden fence shelf unit in the photo above, also purchased in June, is to the right of center of the farmhouse space. 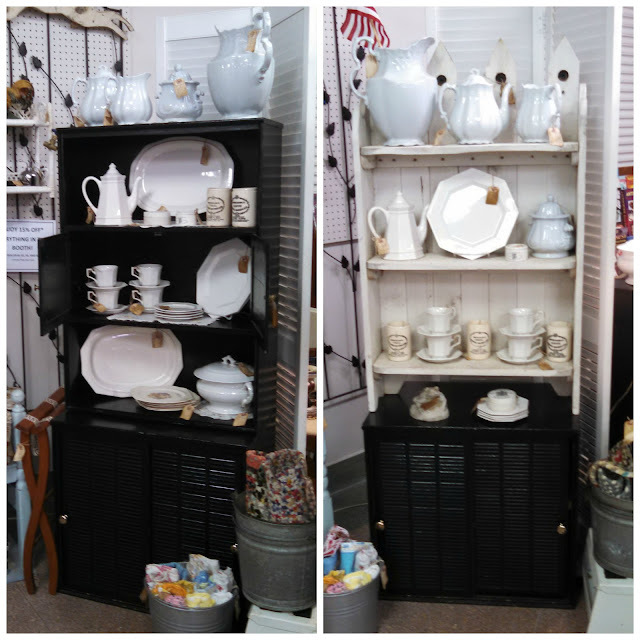 This was where we had our ironstone displayed in May-June, in a black stepback cabinet. We transitioned this corner in stages also, in similar fashion as we did the center area. Here's a look back at those changes ( photo below). You can see (right side) the upper portion of the black stepback was swapped out for the fence shelf unit. It was an EXACT fit, width-wise, not exactly ideal for that many dishes, so it was ultimately changed back to its original black on black, but moved to just the other side of that louvered door you see in the photo above. The two photos below show those iterations of the stepback behind the booth space. The pieces are versatile, I'll say that much. Another area with changes included the space we're calling the military encampment office (photo below). A few new pieces with a masculine/industrial feel include the drafting stool, the solid wood youth chair, and the tobacciana display on the wall with baskets on the right. Across the aisle in another space, just a few children's and/or play items were styled under our summertime picnic table display (most of which already sold). Lastly, sister M has a niche for vintage hats in our space, and she put together a great display with an old, framed millinery illustration, along with a Victorian wooden hat form, and vintage hats. You can see the illustration just above the settee in the photo below, while the form rests on the stack of antique books. Just to the right (outside of photo frame) is a Barrister bookcase, full of more hats. 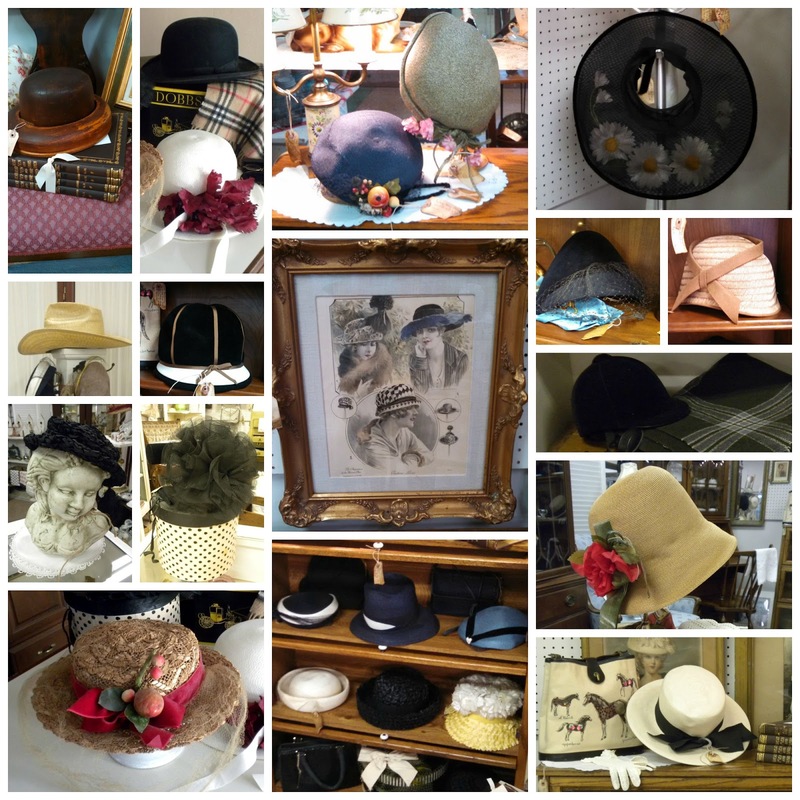 There are probably 3 dozen or more hats in our spaces right now, so I made a collage to show the many different types M's buying and selling of late. Our antique mall will be celebrating its 10th anniversary in its current location the first weekend of August, so we're gearing up for some specials for our customers. Most dealers will have a few items in their booths 50% off, and then running discounts of various percentages off the rest of their booth items. We've been in our spaces 7 years now, and still having fun. 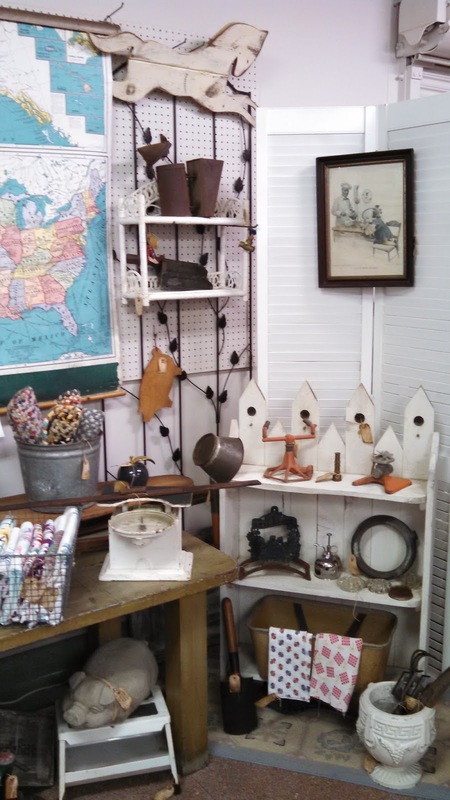 If you're ever traveling through Charleston, WV, where I-64, I-77 and I-79 all intersect, I certainly invite you to stop in the South Charleston Antique Mall on Exit 56 of I-64. It's an easy on/off ramp, and just a few miles from where the other interstate roads intersect - certainly worth the slight detour. It's three + floors (18,000 sq ft) of vintage and antique goodness. If you do travel our way, please drop me a line if you plan to visit our antique mall - I'd love to meet you there! 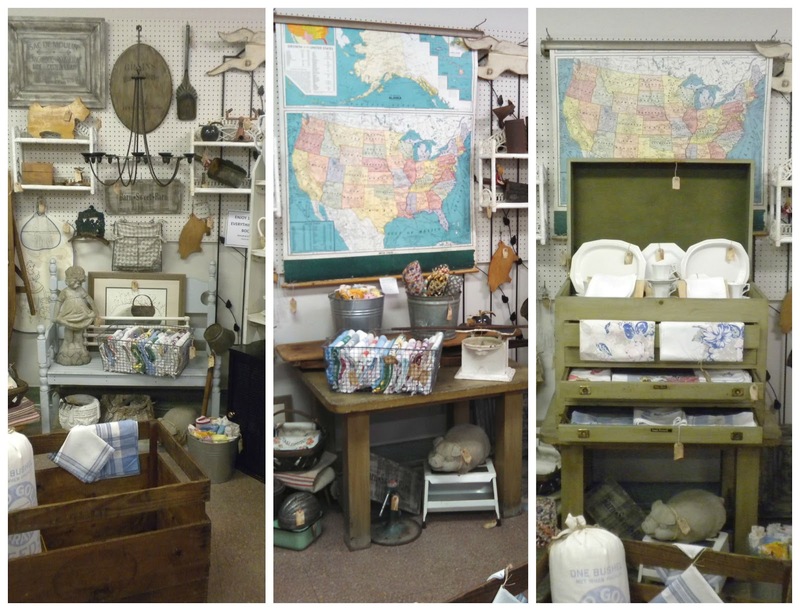 A special thanks to Jill at Bella Rosa Antiques: "Let's Talk Vintage #43!" for featuring this post! In mid-summer you'll find me mostly dodging the high sun and heat, with walks and garden piddling in the mornings, leaving the afternoons for indoor things (like naps) and air-conditioning. It seems my motivation for a few recent changes with indoor decor was sparked mostly by company on the 4th. Retail sales after the holiday were an excuse to finish what I started. A couple of new slipcovers from Ballard Designs in the Courtney Spa pattern provide some coordinating color and pattern to my early-summer mix in the sunroom. 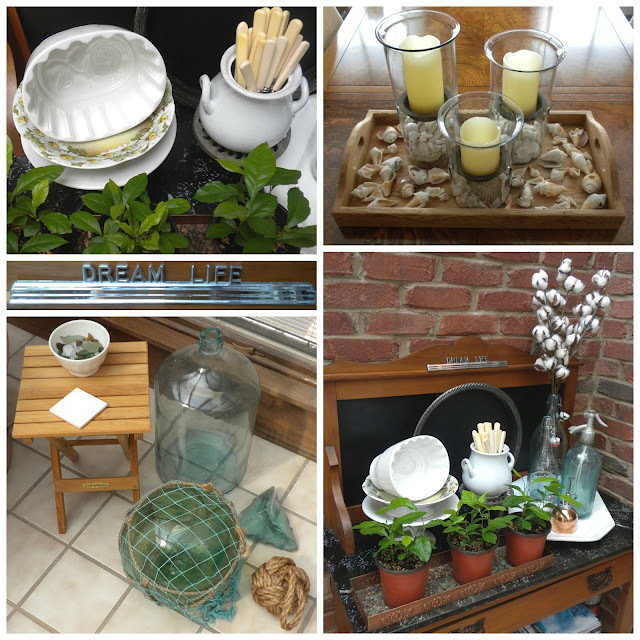 I changed just a few vignettes to coordinate with a lighter, summery touch. 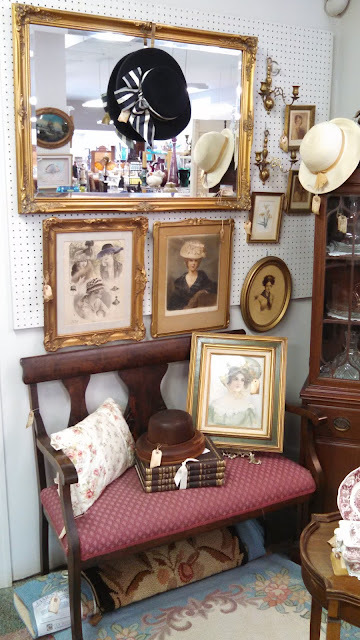 Funny how those recent finds at the estate sale spree didn't seem to make it to the booth spaces yet. The penny glass bottle (below) came from that sale, and the Japanese fishing float was pulled from our booth space (5-finger discount, lol, best kind of sale). The triangular chunk of blue-green glass you see on the floor came from a (now closed) local glass plant which made automobile windshields here in Charleston. The monkey knot doorstop was another item from BD, on sale, and it protects all that glass when the French doors are flung open right beside the grouping. The daisy pedestal stand on the sunroom sideboard was also from the estate sale mentioned, while the broken sea glass and shells were beach found items from past trips. Other accessories were chosen from stash to keep it light, with an overall illusion of cool. "Dream Life" was fashioned from an estate sale desk sign that previously read, "Dr. Fred Van Winkle MD". My lemon plants are thriving under the direct sun streaming through the glass windows overhead. Another sideboard in the breakfast area sports a couple of vintage majolica pieces. 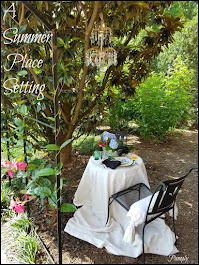 Before using this space for my dessert bar setup on the 4th, I had some of my Quimper faience pottery here. Pictured below is my bar cart, which is in my dining room. 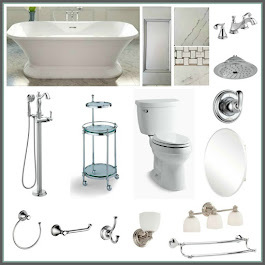 The Jul-Aug issue of House Beautiful mentions a new line of home furnishings coming to Pottery Barn in August, from San-Francisco based designer, Ken Fulk. His "Admiral Bar Cart", a doppelganger of mine if I ever saw one, will be available for $599. I sourced mine for a fraction of that cost (and collected everything that rests on it), at the same estate auction where I won my chaise lounge I slipcovered for the sunroom. I guess everything old is new again, or everything new is old, whatever. Outside, summer has been extremely WET and muggy. Seriously, my garden is starting to look like a jungle. The good news? No annual container or annual beds need watered (over 6" of precipitation in each of June and July so far). The bad news? Lots of weeds to pull, including the much-dreaded poison ivy (knock on wood, no more outbreaks as of yet). Check out these containers - no fertilizers used since being planted in early June. 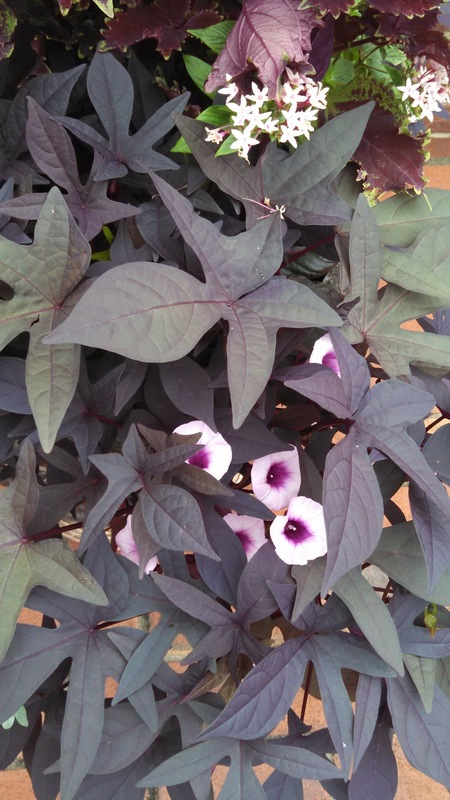 Look what bloomed from my container (below) after the rains this past week among my burgundy potato vine! The blooms look like petunias, and I don't think I've ever seen my potato vines bloom. Ever. Another plant I'm trying for the first time this year in containers, which I'm really enjoying for its texture, color and sun hardiness, is celosia. Celosia, "cockscomb" detail; a sun hardy specimen - I like it! The front annual beds are filling in nicely - not too skimpy, not too bushy. The rest of the landscape plantings, however, look like a jungle. Hummingbirds have had their babies in this region, and they're all dive-bombing each other for the feeders. It's hard to catch those boogers in a photo! 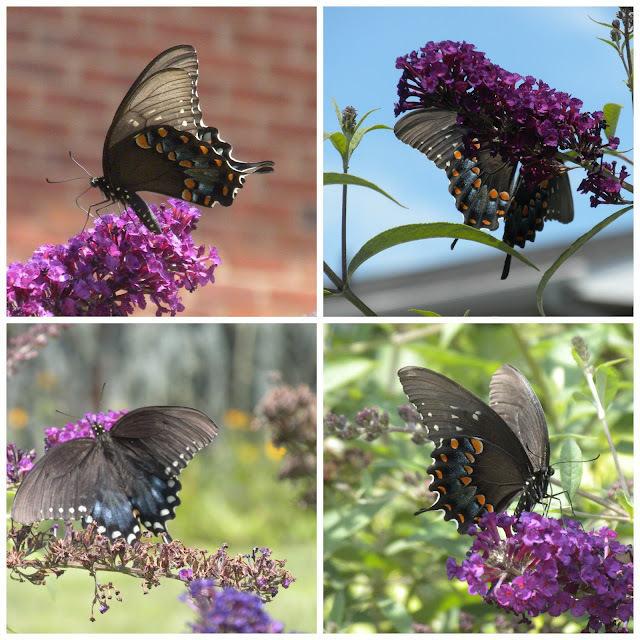 The butterfly bushes are doing their best to attract their namesake, too. 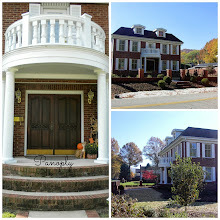 I've been making a list of updates I'd like to start lining up contractors to do around the house, both inside and out. This is not something I get too thrilled about, as it requires a lot of scope management that I've talked about before. You know, the old "one thing leads to another" kind of list, reconciling wants between Mr. P and I. We'll see where this goes. It's also hard to find reliable contractors in this region (or is that a universal issue?) I may just go back to the basement and do another overhaul of "stuff". There'll be nobody but me calling the shots there. We all like deals, right? Well, I for one, like deals. I also like to eat. I generally eat more than my husband. Dining out with coupons has become a sort of retirement sport for my husband and me to see how much money we can save. So did carrying your toy cow into the store to dine with you. Or, you could go full out in your own, creative way like these cute girls did. Udderly and creatively genius, I say. You could stop before or after your meal and have your picture taken with a local, promotional bovine. Or, you could still get a free meal without all that crazy costuming. How? Well, at Chick-Fil-A, it's with their A-List membership. Go online and sign up for the Chick-Fil-A A-List. Make 10 separate purchases at participating stores (that can be 5 times if you go with your mate and use the same card for each individual purchase). Then, BAM! You'll soon get your personalized A-List card, and the freebies start flowing. You get regular emails telling you what your freebies are. Additionally, random receipts will print survey info to complete that yield codes to take back and get more free food. To top it off, at our local dine-in CFA, the management regularly hands out free cards for more free stuff, So, on Cow Appreciation Day, that amounted to nearly $12 before tax for me: a Cobb Salad, a small fountain drink, and a small peach milkshake for dessert. All FREE. Panera Bread is another restaurant chain that offers similar membership freebies by signing up and receiving a rewards card. I'm sure there are plenty of other restaurants that do the same type of marketing, but these are just two that we like. But wait, there's more! This link: Senior Discounts: Restaurants is the 2015 published list of best senior discounts for dining out. Not a senior? Very often, that's not a problem, as many of these deals are available to less than full-fledged seniors (age 55). Mr. P. is several years older than I, and I've enjoyed the benefits several times as his dining partner when he was paying at certain fast-food chains. Even if you don't qualify yet, this will give you something to look forward to, you young, whippersnappers. 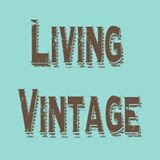 It is with humble privilege that I tell you Panoply is being featured today on Kim-Whitley-Gaynor's blog, Living Vintage. 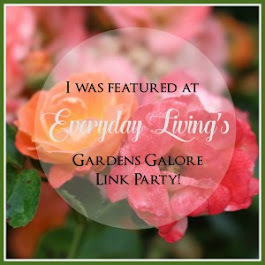 If you are not acquainted with Kim and her husband, Mark, you really need to visit her blog, and not just to read more about me. 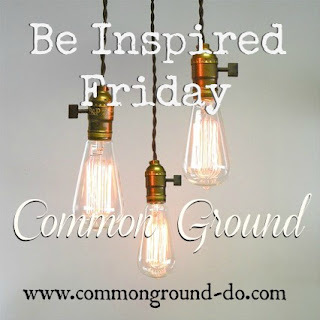 Go to the sidebar and see some of this couple's fantastic reveals of rooms within their East Texas retirement home, along with other projects, which they have deconstructed, designed, and reconstructed entirely on their own, using much reclaimed material. This is their retirement job - meticulously tearing down old buildings in order to reclaim componentry - which they sell outright, or incorporate into projects they are contracted to do. Seriously, Mark and Kim make what we do at Panoply look like clown work. 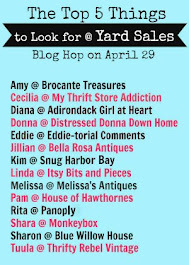 Nonetheless, it goes without saying that I am humbled by Kim's invitation to be featured on her blog today. I hope you will visit Kim, get to know each of us a little better, and maybe strike up a new friendship. 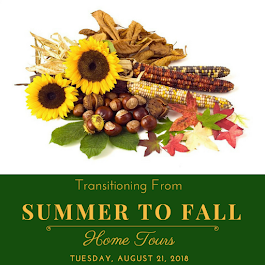 If you are visiting from Kim's blog, welcome! 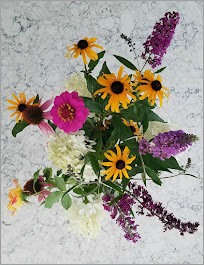 Regardless of how you landed, please feel free to search for posts on some of my favorites subjects - antiquing, styling our booth spaces, gardening - and join in the conversation. I would be delighted to have you stay awhile and visit, and come back often. You may also choose to sign up for new posts by email as a regular reader (I do not use your email in any solicitous manner). 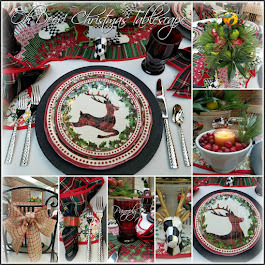 To Kim at Living Vintage: thank you for allowing me to share with your readers through your feature. 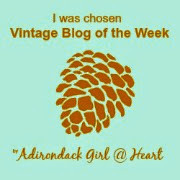 I love your blog and value our blogging friendship!